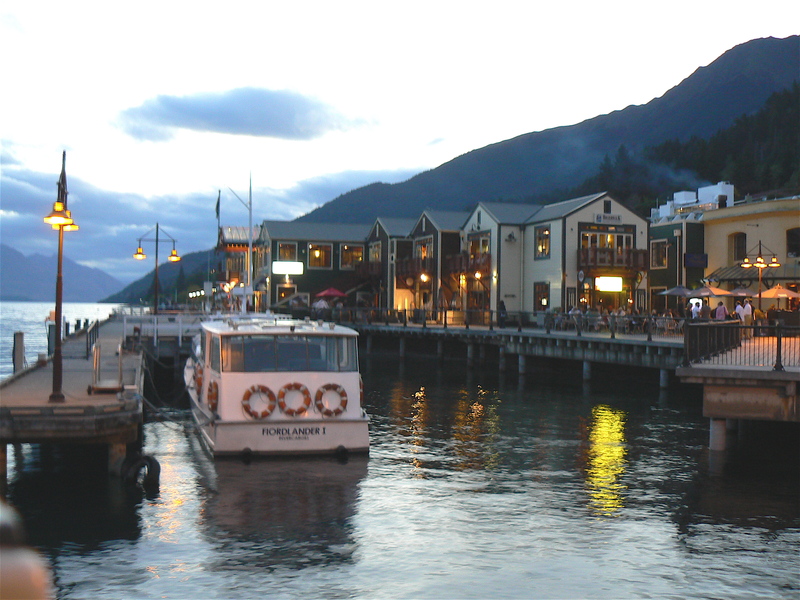 This image of Queenstown, NZ, captures the feeling of my characters’ magical world in my “Song of the Ocarina” novel. I’ll talk about a starting point like this when creating a powerful fictional world, at our Nov. 13 established-writers’ lunch meeting – ALWAYS. How do you go about creating the world in which your characters move around in a novel? By request, your host Ann Videan will present ideas on this topic, having just finished creating a whole new realm for her Delfaerune Rhapsody series. A writing tip, and your own lunch. If you’ve RSVP’d, please SHOW UP. If you run into a conflict, please let me know BEFORE the event so I can make the necessary adjustments for the group meeting. Cheers! • Need contacts to help your writing? • Want advice about your writing? • Like to hang with other cool writers? If so, our tribe – the Alliance for Literary Writers, Authors & Yabbering Scribes (ALWAYS) – is the place for you. We’re an informal group of established writers looking for camaraderie, ideas, enlightenment and connection with writers, especially in the Phoenix metro area, to talk about our craft and businesses. Any established writer can connect with us online through our ALWAYS Facebook page, get listed in our directory of writers on our ALWAYS LinkedIn page, or you can meet with us in person at a lunch meeting. We’d love to have any experienced writer join us at our next meeting … anyone who spends a significant part of his/her week writing, and wants to rub elbows with other writers. That moment… opening the box and lifting out your creation… well, it’s an indescribable. Definitely worth a movie score subtext… if only! I’m also staging a one-day “Amazon Rank-Up” sales event, probably on Tuesday, Nov. 4. Watch my Facebook page and this blog for more details. Another amazing image of secondary characters Axyl Thorne and B’rook Turehu as envisioned by Stacy Lefevre. So, what’s it all about, you wonder? My Song of the Ocarina manuscript won a Top Five Finish award, in the “Realizing The Dream Contest” at the RWA Desert Dreams Writer’s Conference in April 2014. A great start for something I began writing during National Novel Writing Month (NaNoWriMo) in 2010, even before I self-published my first novel Rhythms & Muse. In a companion post, I list the names of all these contributors… Many more lovely people helped make this book possible. A humble thank you. Desperate to understand her place in the world, teenage musical prodigy Lark Tūrehu unwittingly follows her handsome music teacher Noel Stone into the parallel realm of Delfaerune. With her extreme height and long, silver-white hair, she already considers herself a freak in her Queenstown, New Zealand university, so how can she possibly deal with the added burden of her role as the Noble Fae’s leading musical spell caster? Not only must she retrieve and master the Kura Ocarina to earn the title of the realm’s “Maestra,” but the faefolk expect her to use the ancient wind instrument to save the human race from extinction at the hands of the Dark Fae. In Delfaerune, you’ll discover a lush world where music joins with Earth energy to conjure balance among all creatures, extinct and mythical creatures talk and live peacefully, and the Dark Fae pattern themselves after burned-out human rock stars. Song of the Ocarina is filled with music. Listen to and/or watch videos of all the songs mentioned in the novel on my YouTube or Spotify playlists. My women’s fiction novel Rhythms & Muse, along with its complementary soundtrack of five original songs inspired by the story, debuted in 2011. I now create fantastical adventures for new adults in my Delfaerune Rhapsody Series. A professional writer since 1981, I opened my own award-winning home-based marketing firm, vIDEAn Unlimited, LLC, in 1996. 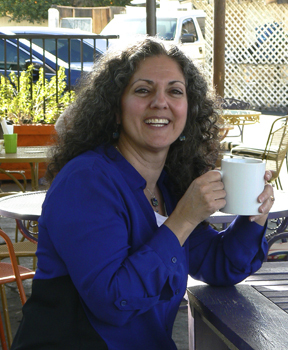 I have served as an editor for corporations, visionary entrepreneurs, and national publishers. My most joyful moments involve filling pages with words, exploring music, documenting memories in photos, gathering people around me with a cup of green tea in my hand, and rolling smoothly down new pathways on my in-line skates. Explore blog posts about writing, my books and music CD, and my writing community here on this site. You can always contact me at avidean@videanunlimited.com. So, could you possibly want to know anything else? I doubt it but, just in case, feel free to ask away! Here she is! B’rook Tūrehu, as envisioned by Stacy Lefevre. B’rook lives on a plane parallel to Queenstown, New Zealand, in the Fae land of Delfaerune. There, in Queens’tyn, the animals talk, extinct and mythical creatures thrive, and sentient foliage lends magical glamour to the Noble Fae. Daughter of the Magister of Karakia (good magic) Knyt Tūrehu and Magistra of Music Fern Tūrehu, and sister to Lark Tūrehu (the heroine). She’s been a captive of the Dark Fae for three years but, in better times, she spent her time as a student. Strengths: Harassing her older sister, and tempting famous rocker Axyl Thorne. Flaw: Her infatuation with Axyl, and the Dark Fae. Quirk: Her penchant for human rock music and fashion. Also, she and Lark are the only two Noble Fae with silver-white hair. 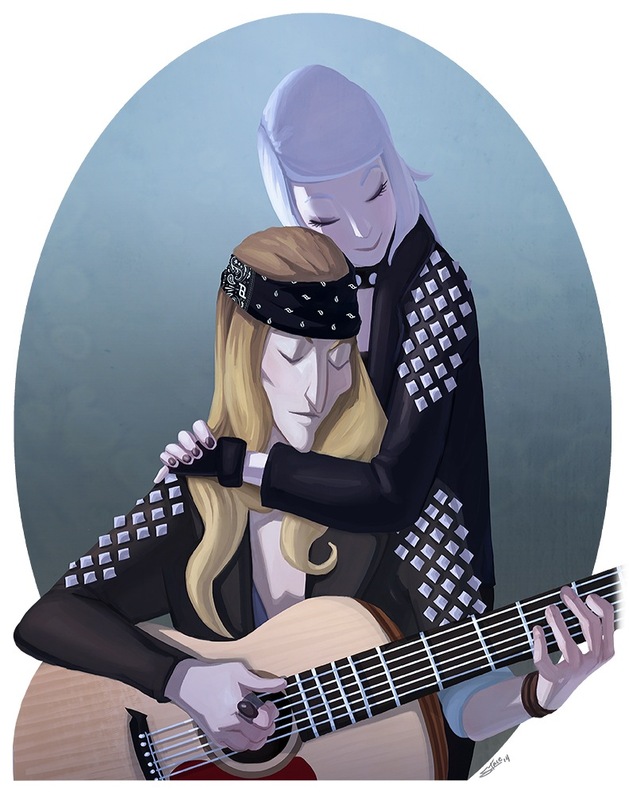 Love interest: Axyl Thorne, Delfaerune’s famous rock star. Learn more about B’rook in the Delfaerune Rhapsody series—my new-adult, fantasy-adventure trilogy-in-progress. 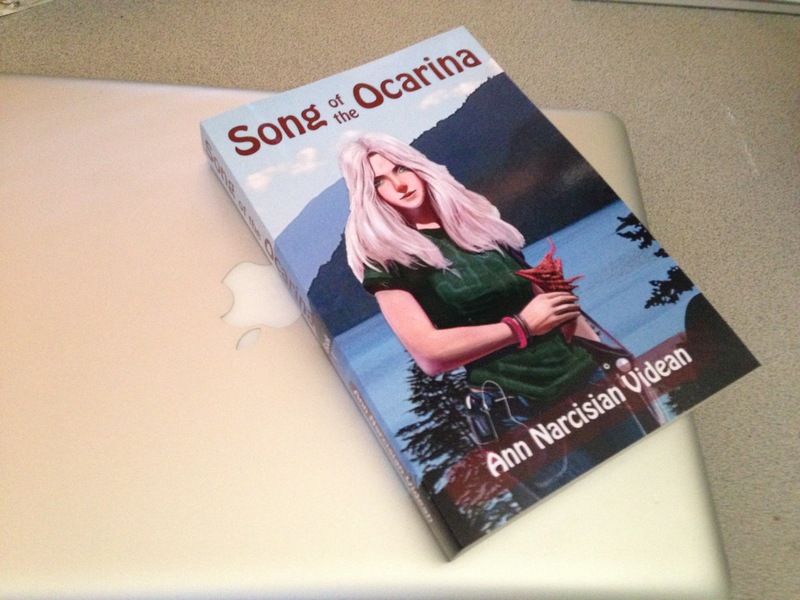 Her story begins in Song of the Ocarina, the first book in the series, due out soon. Watch in the coming days for more character information about the trilogy. Also, watch Facebook, Twitter and LinkedIn. Another glimpse of Delfaerune Rhapsody character B’rook Tūrehu, as envisioned by Stacy Lefevre. 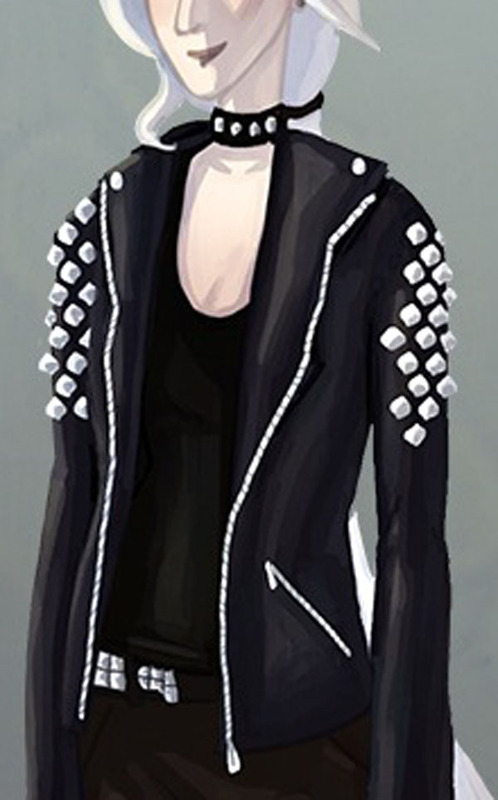 B’rook just turned 17, a coming of age in Delfaerune, and her edgy attitude is about as tall as her 6’2″ height. Her penchant for human rock music makes her seriously jealous of her sister Lark’s iPod. But she has one thing her sister never will… famous Fae rocker Axyl Thorne. First glimpse of Delfaerune Rhapsody character B’rook Tūrehu, as envisioned by Stacy Lefevre. B’rook Tūrehu… sister to our heroine Lark. Both girls, daughters of the Magistrates of Magic and Music in the Fae realm of Delfaerune, are the only two Noble Fae with silver white hair. Can you tell from her boots she’s a bit of a wild child? Maybe that’s why she’s fallen for famous rocker Axyl Thorne. Axyl’s known for his long, thick, blond locks. He’s kind of gorgeous and among the most talented musicians ever. He picked the Bush Lawyer—a very thorny plant—as part of his marketing for his band “Thorne,” for a good reason. Most Dark Fae pick an animal familiar to help befriend and protect them, but Axyl‘s only ever-present companion is his posse of fan girls. Hey, a posse provides the same basic support—with benefits—right? His wandering eye is paused for the moment on our heroine Lark’s younger sister B’rook, who’s just coming of age. He carries a secret about his lineage, which not even B’rook knows. As an opportunist, he likes to hang out with the Dark Fae, but is that where he really belongs? To find out more, you’ll just have to read about it in Song of the Ocarina, the first book in my pending new-adult fantasy adventures — the Delfaerune Rhapsody series. Watch for a full character image reveal of Axyl here in my blog, and also in my Facebook, Twitter and LinkedIn feeds. Another peek at Axyl Thorne, famous Fae rock star. He’s 28 years old, at 6’10” his height matches his ego, but he does have a soft spot for rock ballads, and a certain Noble Fae chick, who just might be the daughter of a kidnapped Delfaerune magister. Oh, and did I mention his best buddy, our antagonist, is Mikk Stone? Axyl’s artful hands hold a secret, and silent, skill beyond guitar riffs and picking… but I’m not telling you what. I guess you’ll just have to read about it in Song of the Ocarina, the first book in my pending new-adult fantasy adventures — the Delfaerune Rhapsody series. Watch for more character image reveals of Axyl here in my blog, and also in my Facebook, Twitter and LinkedIn feeds.